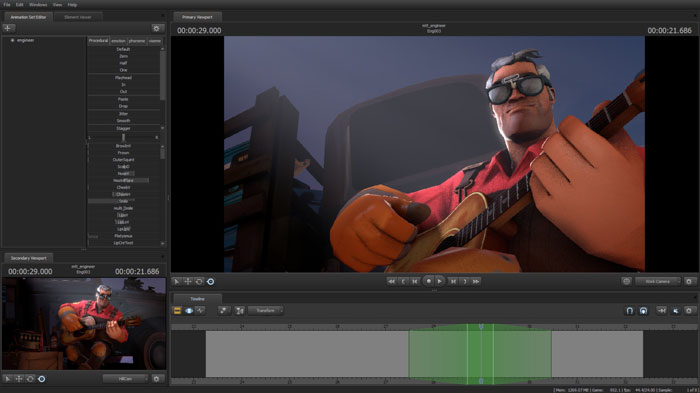 The Source Filmmaker (SFM) is a movie-creation tool built and used by Valve to make movies inside the Source game engine. It has been used to create over 50 animated shorts for games built on the Source Engine. The tool is directly built off of the Source Engine. 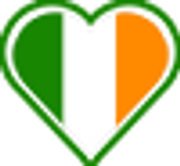 It is freely available to download from Steam (Windows Only). Check out the official website for updates and news. 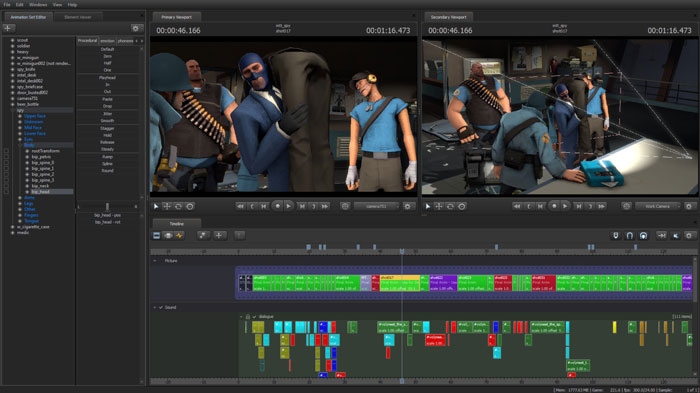 Source Filmmaker was developed internally by Valve as far back as 2005, forked from the Source engine’s in-game demo playback tool. It was used to create the Day of Defeat: Source trailers which used experimental effects that could not be achieved in real-time. The full potential of the tool came into light with the release of The Orange Box, and esspecially with the release of the Meet the Team shorts for Team Fortress 2. That version of SFM, which ran using Source‘s in-game tools framework, was accidentally leaked during the public beta of TF2 in September 2007. Since then, the tool has matured with a complete interface overhaul built in QT, and given its own engine branch for further development. Before the tools official release to the public, Team Fortress 2 used a watered down version of the tool called the Replay Editor. It was limited to capturing the actual events occurring over the course of a player’s life with no ability to modify actions, repeat segments, or apply special effects beyond those already used in-game. However, arbitrary camera angles were possible, like tracking the actions of other players in action at the time. Replay incorporates the ability to upload completed videos to YouTube. 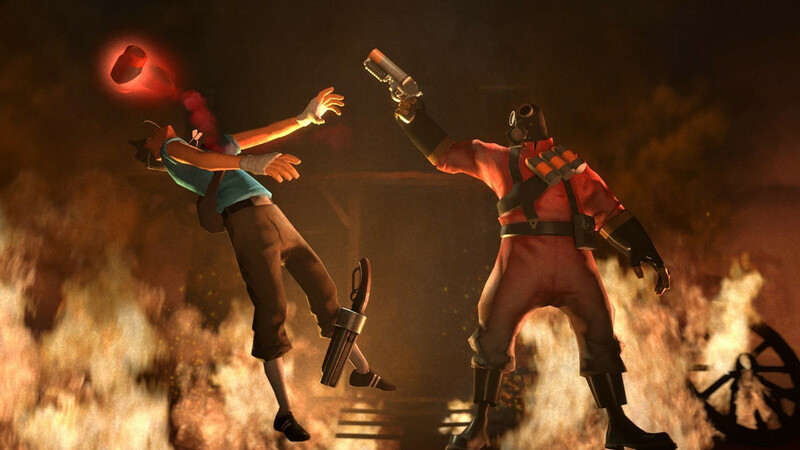 June 27, 2012: Valve Release the first beta for the Filmmaker to coincide with the release of the Meet the Pyro short. April 1, 2013: Valve provide Steam Workshop Access making it easier for those working in the Filmmaker to share content. June 18, 2015: This date marked a big change for the Source Filmmaker. Alongside the Dota 2 Reborn release, a new and updated Source 2 Compatible Client for the Filmmaker is now available bundled with the Dota 2 Reborn Beta. The Source Engine version will still exist and will hopefully continue to recieve updates. It differs from other movie making tools in that you can re-use assets and events from the game world in your productions, It merges the complete workflow of movie creation, editing, motion capture and post processing effects into one system. Source Filmmaker boasts a what you see is what you get approach of movie creation and editing. It doesnt require a render farm cluster, or very expensive compute processors, it functions well on a relatively modern PC. The 3D recordings you create in the Filmmaker can contain recorded gameplay, objects, cameras, lights, particles, animations, effects, and sounds as well as the motion information for how each element changes over time. SFM gives the user a “Work Camera” that enables them to see what they are doing without messing up the scene cameras. The Clip Editor is used for recording, editing and arranging shots, which can contain recorded gameplay and user-placed assets. 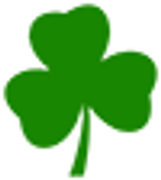 The Clip Editor also allows the user to place and arrange sound files and video filters. The Motion Editor is used for motion adjustments over time, such as seamlessly grafting two animations together. Motion presets (e.g. jittering, smoothing) can also be applied onto selected motion paths. The Graph Editor is used for editing motion through creating keyframes, this is extremely useful in pose-to-pose animation. 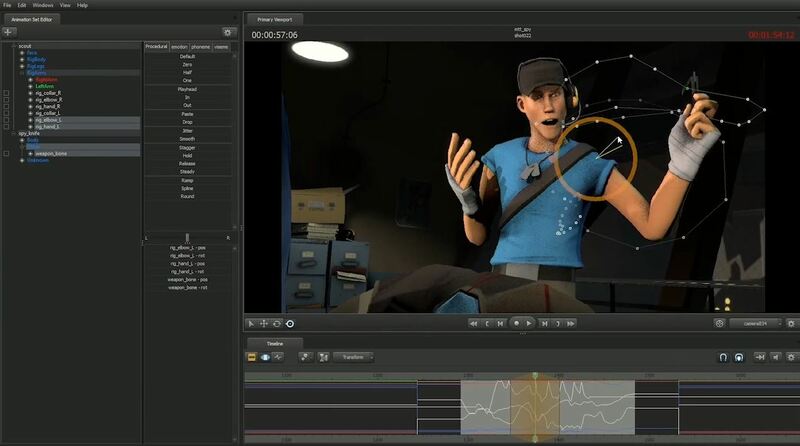 The Source Filmmaker allows users to record and edit motion from gameplay or scratch, as well as record a character many times over in the same scene, creating the illusion of multiple entities. SFM can support a wide range of cinematographic effects and techniques such as motion blur, Tyndall effects, Dynamic Lighting, and depth of field. SFM also applies motion blur per-object. It also allows manual animation of bones and facial features, allowing the user to create movements that don’t occur in-game (as in games, nearly all character animation sequences are stored in a set of different movements, and the amount of different animation sequences is limited). There is a caveat though, despite the deceptively simple UI, this is a very powerful and complex tool without a lot of safeguards. Think of it like a tractor, it doesn’t have railings or a lot of padding like you might find in a normal app or game. We recommend that you watch the video tutorials first and then read the documentation to familiarize yourself with the tool as much as possible before you dive in. The Saxxy awards are an annual event hosted by Valve promoting community creations in SFM for Team Fortress 2. The community create shorts, they are nominated and there is one eventual winner each year. It has been running since 2011. Best Team Costume: MIGHTY MEDIC UBER RANGERS! Most Extreme Stunt: Reflect! Reflect! Reflect!